The United States has long been a dream destination for number of immigrants in a pursuit of better standard of life. The dream of US immigration baits immigrants from various parts of the world to seek out their career opportunities in the US for better prosperity and success. Every year, US welcome a number of foreign nationals to reside and work in the US. Many employers in the US often need highly skilled employees, thus there are various short-term work visas that enable employers to recruit foreign workers in order to reside and work in the country. 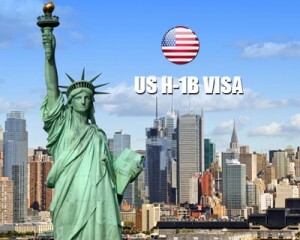 US H1B visa is one such temporary visa issued for overseas employees to work in the US. What is US H-1B Visa? H1B visa-work visa to US, is an employment related non-immigrant type visa designed for temporary employees to migrate to US. This visa is an employer sponsored visa type, that is, an employee must hold a job offer from an employer, and only employer needs to apply for H1B Visa for the sake of his or her employee with the US immigration department. This granted H1B Visa Petition acts a work permit that enables individuals to get their visa stamped and work in the US for that specific employer. US H1B visa is granted to a specific profession that needs academic and sensible application of the body of specific knowledge together with a minimum bachelor’s degree or its equivalent. The US H1-B visa has an annual cap of 65,000 visas for each fiscal year. An extra, 20,000 number visas were set for individuals who have completed their master’s degree from the US University. This limit on US H1B visa applications is subjected to change. Basically, first time this visa will be granted for a period of three years, and later it can be extended further for a period up to three years. However, individuals entire stay cannot be exceeded over six years. In order to get a successful visa approval, applicants should hold a valid visa, must fill the application form with all the appropriate details, pay the fee and must attend the visa interview at the nearby valid US consulate in the native country with all the documents required for H1B visa approval. One of the essential requirements for US H1B visa is the education. To be eligible for H1B visa, the potential H-1B worker should hold the US bachelor's degree or higher degree, or its equivalent. The individual must have a US comparable 4 year’s bachelors or higher degree from an certified university or college. In case the overseas degree is three years bachelor's degree, then three years of work experience in similar field or profession could be considered to one year extra education. Besides academic qualifications individuals should also enough qualified to perform the position offered duties legally. For the occupations that need licensure, the applicant should already hold such qualification prior to the US H1B visa petition filed. If you are willing to apply US H-1B visa, fill out our Enquiry Form, so that one of our visa expert will approach you soon.